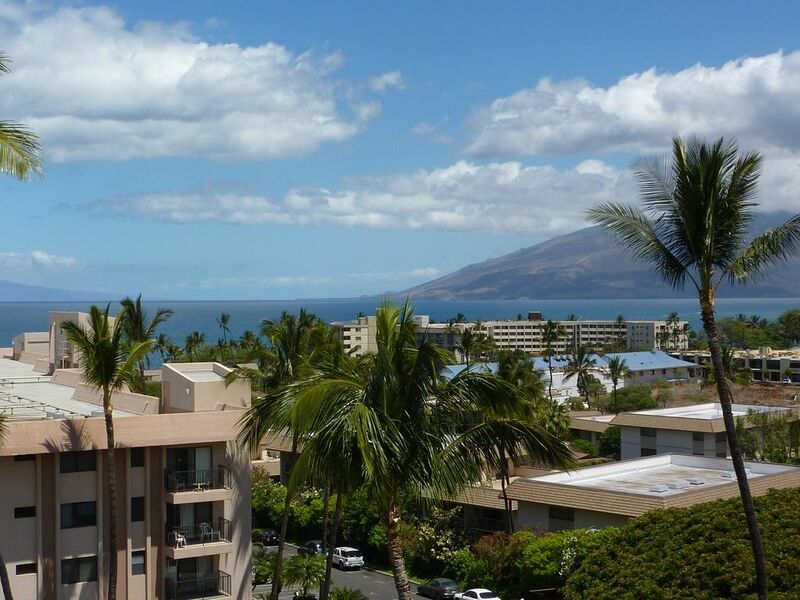 With whale-watching, sunsets, and swaying palm trees in between, this top-floor, one-bedroom unit has one of the best views in South Kihei. Located at the back of the complex, it is high up and has no street noise--only the rhythm of the surf washing up on beautiful Kamaole II Beach, just in front of the complex and a quick walk down the lushly landscaped drive. Safe for kids and novice swimmers, and one of only three life-guarded swimming beaches in Kihei, this pristine stretch of sand is backed by a park with restrooms and showers, and cradled by rocky points on either side where snorkelers may swim with tropical fish and sea turtles. The unit's spectacular Western view encompasses the West Maui mountains, the islands of Lanai, Kahoolawe and Molokini, and continues on southward to the palms and golf courses of Wailea. Sunset is the event of the day year-around; from the comfortable swivel chairs at the bistro table on the lanai you will enjoy a clear view of the sun sinking into the Pacific, as well as the sounds of the conch-blowers and the whisper of the palm fronds as evening falls. But here's the best part! The comfortable unit has recently undergone a high-end update, including solid maple cabinets, slab granite countertops with tile backsplash, new appliances, new furniture, carpets and decor, a queen Beautyrest bed in the bedroom plus queen sofa sleeper in the living room. Also included are a completely outfitted gourmet kitchen, computer desk with complimentary high-speed wireless internet access for your laptop, and free long distance calling to the Mainland and Canada. There's a flat screen TV/DVD, plus stereo and CD player, and even original artwork. Beach chairs and beach towels, coolers and other fun amenities are provided for your convenience, as are all necessary linens and table decor. Less than one block away is a wide selection of restaurants, shops, and small grocery stores--no need to get in your car several times a day. Whether you are looking for romance, adventure, or just relaxation, you will love the affordability, the location, and the tropical ambiance of this superb accommodation. That's me welcoming my grandaughter on her second visit to Maui, an island with a good bit of my family's history intertwined. When my folks started coming to Hawaii in the 'fifties, they visited each island, then narrowed it to each location on Maui, and ended up in Kihei, just the best! Best access, best beaches, best weather, and nicest people. So when I decided I had to have a place of my own, they had done all the work for me! I have loved this location and my sweet condo with its large view for nearly 30 years now, remodeled it twice, and have a harder time every year dragging myself back to Seattle. But if I never left, I wouldn't be able to share it with all the wonderful guests I've welcomed over the years. I hope you will join them! It's simply 'no ka oi' - the best! Cleanest ocean water on Maui (no agriculture upcountry), sweetest outlook due west with outlying islands, best whale-watching, and safest swimming beaches in Kihei. Two-block walk to family restaurants and shops, easy access to Kahului and airport. I love to be outdoors--whether it's hiking, swimming, suntanning, or watching sunsets. I hike across Haleakala every year (to make sure I can still do it!) and tell my guests about other wonderful places to explore in my guest book. I think there can't be more lovely nor safer swimming beaches than the Kamaole Beaches--no rocks, gentle surf, water as clear as glass and as caressing as silk. And I make new friends down around the pool and barbecue grills every time I visit, but I can always retreat to the peaceful surroundings of my top-floor eyrie to watch the sunset and comtemplate the beauty of this magical island. Recently remodeled with granite counters and maple cabinetry, completely tiled tub enclosure with glass door. Tub/toilet area is compartmented - door closes off from vanity/sink area. Continuous quiet building vent fan keeps bathroom fresh. Excellent beach for swimming or snorkeling is right in front of complex - no need to drive. Free local and long distance calls to Mainland and Canada plus answering machine. Comfortable pullout sofa (new in 2019) seats three, easy chair situated with good reading lamp. Built-in above range with vent fan, convection ability. Basic cleaning supplies, useful tools, several portable coolers, breadbaskets, etc. Several complete sets of dishes and glasses to serve up to 8. Tray storage with cookie sheets, muffin tins, etc. Serveware for entertaining, unbreakable utensils for pool use. Onsite tennis court may be booked at office for reserved play. Two pools with new tile and decking and ample sun chaises and small tables, as well as several dining tables and two commercial stainless steel gas grills at each pool. We loved this little condo. It has a nice view of the ocean and has all the necessities for an extended stay. We found it convenient to all the activities on the island with great beaches walking distance away. We had a fabulous stay at this property! Very nice, comfortable and convenient. We enjoyed the stay here very much. The parking, elevator, and unit are all very conveniently located-if you have kids, mobility issues, or just have things to haul it is very convenient. The pool is conveniently located as well. The view from the lanai is beautiful-you really could not get better. The unit itself is nicely decorated and pride of ownership is evident. It is very homey and comfortable to return to and call home in the evenings. Condo is a short walk to beautiful beaches, restaurants, and little shops. Beautiful! Wonderful location, lovely condo. We felt right at home in this comfy, well-stocked home. Beginning each of our mornings and ending each day sitting on the lovely lanai, gazing out at the ocean and swaying palm trees. The kitchen was a cook’s dream; everything we needed at hand. Loved having beach chairs and plenty of beach towels for many a happy hour at the water’s edge. We also enjoyed the swimming pool, especially when the temperatures soared to 90! We loved how clean and welcoming the condo is, and how great its location is — easy access to any- and everywhere! You made our first visit to Maui extra special. We will be back! Mahala nui! I usually stay in smaller buildings but last minute I opted for this condo in Kihei. The location is super convenient near restaurants, shops and Kam 2 beach. You can walk everywhere. The complex has 2 pools which is nice when one pool has kids and you want to do laps. The condo itself has everything you need, comfortable bed, fully stocked kitchen, nice balcony. Being on the top floor allows for the pleasant breezes. it was hot but with the fans and breeze, very pleasant. When we had a repair to do, both management and owner were quick and responsive. I usually have fear of heights and did not think about that, but I got over it? and I did not even mind the modern elevator. Sometimes the stairs provided exercise when I was not too lazy... I did not do the botanical walk, but there is a map and you can walk around the very well maintained garden and see all the local botanical plants. Thanks Jeanne for sharing your beautiful place with us. Always a good time in our home away from home! Has the best view ever! Everything you will ever need is in this condo! Excellent snorkeling from rock points at both ends of beach in front of complex. World-class aquarium at Maalaea about 7 miles north, plus fantastic whale-watch boats hosted by Pacific Whale Foundation. Don't miss the Saturday 'Swap Meet' in Kahului (7 a.m. until 1 p.m.), best place for flowers, local fruit and veggies, shave-ice, and best prices on treasures to bring home. RENTAL RATE DISCOUNT OF 10% FOR ANY BACK-TO-BACK BOOKING! Check in is 3 p.m., check out 11 a.m. Early check in or late check out may be available at no extra charge. $150 cancellation fee up to 60 days before arrival, thereafter, refund may be available only upon booking to another party.